The light and airy detached accommodation sleeps 2-5 consists of 2 Bedrooms with fitted wardrobes, 1 Double and 2 singles. A 5th small person or child can be put up on a fold away bed and is an additional nightly charge. With ceiling fans and ample storage. Large open plan lounge with 2 sofas, UK Satellite TV,Portuguese TV Meo, DVD, Playstation2 and a large Book and DVD library. New!! Woodburner for the winter evenings. Wood included in the rental price. The Fully fitted Kitchen includes Fridge/Freezer, Table and chairs for four, coffee machine, Toaster and everything you would need for your self-catering Holiday. There is one bathroom located in the House with a large walk-in shower, hand basin and Toilet. Bath towels are provided but only for use within the property. Additional pool towels are also available which can be used for the Beach. Private sun terrace and veranda with outside dining. Also, outside there is an additional Toilet and Shower block for your convenience. Casa de Olival is Registered with the local Council and holds a licence for Tourism. Alojamento Local license ~ number 19839/AL . This is your assurance that we comply with the latest safety standards & regulations which is governed by the local Council and we have been inspected to ensure we comply. The licencing is to ensure the quality of accommodation for visitors to Portugal meets proper and acceptable safety and hygiene standards. 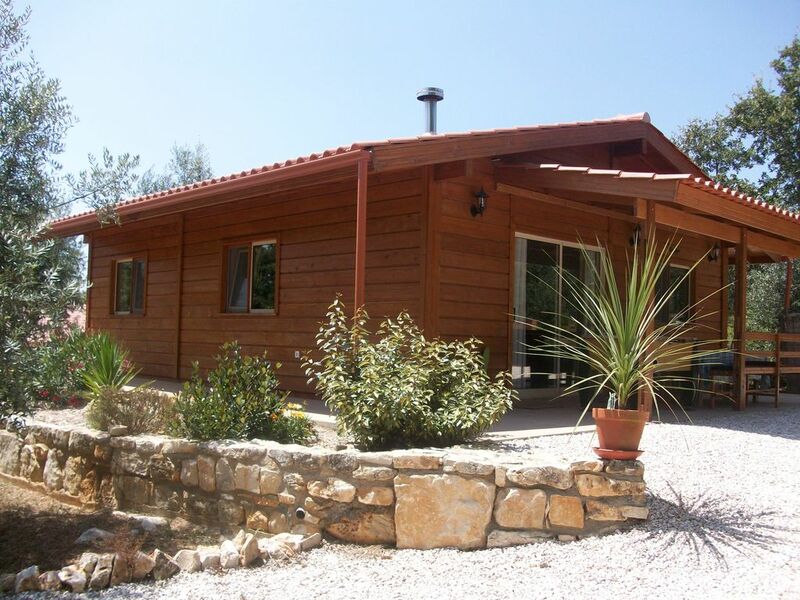 Casa de Olival is an * ecological Wooden House offering self-catering Holidays for 2-4 people. Located in a small Hamlet in beautiful Central Portugal. * Located in a Natural Park the House is sympathetic to it's surrounding and is of wooden construction with quality insulation, double glazing thus ensuring cool in the summer and warm in the winter. The University city of Coimbra on the river Mondego is close by as are the Templar Town of Tomar and the Pilgrim Town of Fatima, to name but a few. Set in 1.5 acres of old Olive Orchard currently being restored for future harvesting. Surrounded by tranquil Pine and Eucalyptus woods ideal for nature walks and Bird watching. Peaceful and relaxing for the perfect Holiday yet minutes away from all the amenities that the Market Town of Ansião has to offer. After taking early retirement took to travelling round Europe in a motor home eventually deciding to settle in Portugal. We loved not just the climate but the stunning and diverse countryside, and cannot put in adequate words how friendly, genuine and welcoming the Portuguese people have been. We chose this area primarily as Tania's mother lives here, but after visiting realised how unspoilt and beautiful the area is ~ having travelled extensively and owning holiday accommodation in Spain for 7 years we appreciate the non commercial and rural aspect of life here. Love the tranquil and beauty of this area without being far from a lovely Town with good facilities, also not far from cosmopolitan Cities when the fancy takes us. The balance here is perfect. 2nd Bathroom is outside in it's own building. Basic yet functional with an electric shower, toilet and sink. Exclusive use for Guests only. Bath Towels inclusive for use within the property only. Beach towels are also provided for use round the pool or to take to the beach. Comfortably seats 4~5 on sofas plus bench style seating. Coffee table. Comprehensive Book/DVD library. Different languages catered for. Basic condiments, Teas, coffee and sugar. 4 ring gas hob. Electric oven. Coffee maker. Fully supplied for all your self catering needs. As well as dining area in the house ~ Additional dining area outside under covered terrace. To seat 4 ~ 6. Large DVD selection to cater for all ages. Well furnished and equipped, set in the heart of rural Portugal. A peaceful retreat from the hustle and bustle of life. There is so much to see and do provided you are happy to drive everywhere. Fortunately the road network is amazing and incredibly quiet. We would have loved some bikes to use on the quiet local roads and explore the local area a little more. I think for us we were too far from the coast but that was a choice we made. There are river beaches locally. Tania was amazing; she went out of her way to get maps tor walking and nothing was too much trouble. Most helpful host ever! Thank you so much for your review. It is most appreciated. We are pleased you enjoyed your stay and will take the suggestion of providing bikes on board and look to provide these for future guests as you are right, our roads are so quiet and there is plenty to see. A very spacious comfortable lodge with all needed amenities, it was very clean and well maintained and even had a welcome hamper with essentials including a nice bottle of wine. There is a log burner in the lounge which was really nice in the evening when it was a little chilly. Tania and Steve were very friendly and helpful and even helped us with places to visit. There is a beautiful swimming pool but it was a bit too cool for use in February. The central location was ideal for visiting local historic towns like Coimbra and Tomar and some great places to eat locally. I would definitely recommend family and friends to stay here and will certainly be returning myself. Thank you for your lovely review and we are pleased you enjoyed your stay and we look forward to welcoming you again......you can try the pool out next time !! Euer Holzhaus ist ein Traum. Urlaub in der Natur, und doch so zentral, dass alles nah ist. Seien es Einkaufsmöglichkeiten oder auch Sehenswürdigkeiten. Danke für einen schönen, erholsamen Urlaub. Nous avons passé un excellent séjour chez Tania et Steve. Tania nous a fourni toutes les informations pour notre installation. La maison est très agréable avec accès à la piscine sans contraintes. Lieu calme et reposant sans être très loin de la ville et des visites. Just got back from a fantastic stay in Casa de Olival. Missing it already. The house is a lovely location, so peaceful. It is a very well equipped and clean house. The kids loved the pool and we loved the owners, Steve and Tania. They are so accommodating and friendly people. Nothing is too much trouble. Steve lit the wood oven one day and helped us cook our homemade pizzas. The dogs are lovely too. A car is essential here to get to the house, local shops and bars but it is in an ideal location to explore lovely Central Portugal. The house also comes equipped with TV, Wifi and DVD player. Ideal if weather not too good. There are also some lovely walks around the area and you will find plenty of ideas about what to do in the handy resource book and pamphlets kept in the house. Their Facebook page also has some really useful tips. Thank you so much for a lovely time. We really appreciate the great reviews and feedback. So pleased that another family have enjoyed their stay at our Holiday home. The weather was fantastic and great to see the pool still being used right up to the end of October. We are always posting ideas for different days out to enhance everyone's holiday and collecting information for the House. We hope to see you all again in our peaceful and diverse part of Portugal !! We stayed at here in August 2013. After having a special holiday in Florida the year before with our 13 year old twin boys my husband and I wondered if we would be able to match such a good time. We need not of worried as we all had the most amazing time. The boys loved it as did my husband as we discovered the prices in the restaurants and supermarkets very reasonable. It is set in beautiful peaceful surroundings but within easy reach of fabulous beaches (about 40 mins by car) and closer we visited picturesque country river beaches. Not only does it have the perfect setting for a great get away from it all holiday but extras like the pool, football nets, football table, games, books and ps2 make it truely a home from home. A brilliant place for close family fun we have some lovely memories of our time there. Tania and Steve are the perfect hosts with lots of information and always on hand to ask any questions. We had a fabulous pizza oven night and lots of tasty barbeques. Oh and we have to mention the adorable dogs who added character to this delightful place. We had only been home a couple of weeks and we all agreed we just had to return. Can't wait for next August! Having holidayed ourselves with a young family in past years we found we preferred to stay in self catering accommodation set in more private settings, as opposed to commercial Hotels catering for the masses. Some of the best places we have stayed in had furnishings and personal items such as DVD's, books, local and Tourist information etc which really made it feel like you were staying in a home rather than an empty, sparsely furnished apartment. So, with all that in mind this is what we have set out to provide with our Holiday home and gardens. Reading reviews like this makes us feel like it is all worth while. We hope when this family returns we will have more information and improvements to further enhance their holiday experience. Cam and Brad ~ the dogs and pool are waiting for you !!! This is your assurance that we comply with the latest safety standards & regulations governed by the local council. Set in a tranquil Olive grove yet 2 kms outside of the Market Town of Ansiao, Central Portugal - with all the usual amenities. 40 mins from the beaches at Figueira da Foz and Silver Coast. Or closer to home fabulous picturesque River beaches at stunning locations. Lively Festas throughout the summer and a good selection of restaurants and bars. Great place for your holiday whether it is a peaceful relaxing time just lounging by the pool, or discovering the historic Templar Towns and countryside within this diverse area. The old rural way of life can still be seen and the Portuguese friendliness is second to none. The University city of Coimbra on the river Mondego is close by as are the Templar Town of Tomar and the Pilgrim Town of Fatima, to name but a few. Also, visits to Conimbriga - the largest Roman settlement in Portugal, Grutas Mira de Aire, the largest and most impressive caves in Portugal and the longest and oldest Dinosaur track/footprints can all be discovered in the area.